Whilst in Kenya, one project that the team was carrying out was an ecological survey of freshwater microbes in several different locations across Kenya, and whether the diversity of microbes correlated at all with the diversity of animals species seen. One such location which was sampled was Lake Oleiden, which proved to be a hotspot for wildlife. 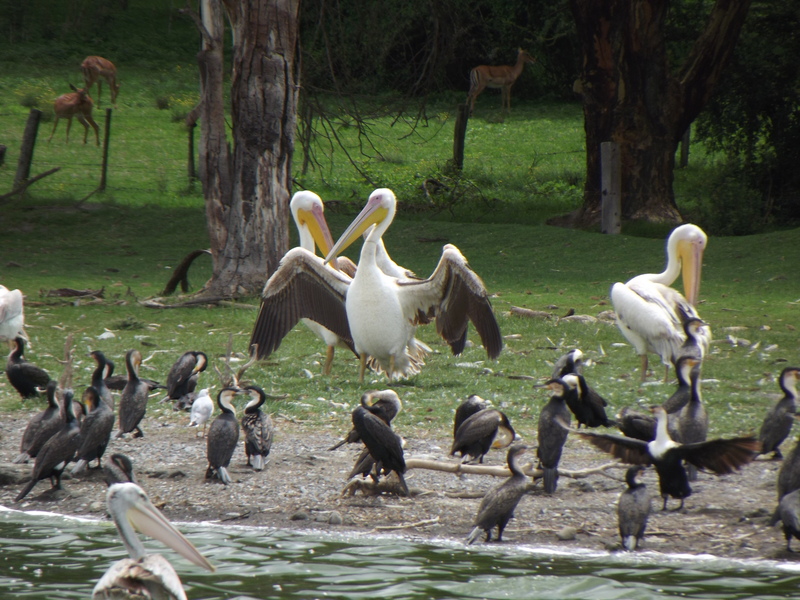 Lake Oleiden is located next to the much larger Lake Naivasha, from which it has recently separated, and is slightly saline in nature. The lakes are home to many fish species, a whole host of water birds, and hippopotamus. The water samples collected showed that the lake is rich in phytoplankton (microscopic plants) and many species of flagellates, tiny single-celled organisms which use a tail-like appendage called a flagellum to move around in the water. Flagellates and phytoplankton are important sources of food for tiny invertebrates such as water fleas and copepods, which are in turn eaten by small fish. As a result, there was an incredible diversity of fish-eating bird species, with over 10 different species of bird seen on the lake. There were two species of cormorant seen, and they had established several nesting sites at the banks of the lake, supporting one of the largest congregations of these birds in the country, according to our local guide. Also present were several flocks of great white pelican (pictured within a multi-species community with cormorants and gulls), which were seen feeding alongside terns, gulls and a pair of pied kingfisher, which we were lucky enough to see hunting for fish. At the shore of the lake were a variety of herons and storks including the little egret, marabou stork, yellow-billed stork and the black heron, which has an ingenious hunting strategy, using its wings as shade, attracting fish for it to catch. The lake is also home to the impressive African fish eagles, seen swooping to catch fish from the water’s surface. This great diversity can be sourced back to the microbes. They provide food for tiny invertebrates which are in turn consumed by the fish in the lake. And of course it is the fish which attract the birds to the area, promising a rich source of food, and by extension, a suitable breeding ground for several species.